Nance Van Winckel, poet, fiction writer, and collagist extraordinaire, inventor of the pho-toem, has gone undercover for Numéro Cinq, searching out and interviewing a series of hybrid or conceptual artists (cross-genre art — ah, but is there any other kind?). Her first subject/artist was collagist Todd Bartel, and now she introduces us to the amazing book art of Marilyn R. Rosenberg of Peekskill, NY, who, yes, explodes the concept of book into a phantasmagoria of cutting, folding, sculpting, drawing, image layering, colorizing, painting — books become sculptures, words become objects, objects become poems, poems become objects AGAIN. We all love books, adore books, but mostly for their efficacy as carriers of words, which, if you follow the logic, leads us all to owning tablet readers; what Marilyn R. Rosenberg creates is the anti-Kindle; you can’t read these on a device; she creates unique books, not for dissemination but for themselves for the beauty of the thing. READ, closed 5 1/8”h x 4 1/8”w, color photo copy edition of 15 with collage, visual poetry artists book with hand made pop up. VERBIAGE, 22 1/2 h x 16 1/2” w, visual poetry/drawing. NVW: Spending some time with the inside pages of these amazing books of yours, I’m interested in how you think about finding the right “balance” for a page—the page as drawing and the page as poem. I so admire the convergence of those two. MRR: Both a work’s theme as well as its obvious or hidden contents decide everything about a particular page or bookwork. But how do all components, word meld into image, image size happen next to word size? How do I select hue, value and blank and filled areas? How does relationship and interaction and placement of each component happen? Balance is based on many things: sometimes the influence of the ground, i.e. the page, size, paper, book, either found or ready to be created with my own binding; each choice, alone or in combination with mark-making materials, adds and alters compositions, in variations, within a singular statement. Or sometimes, a word or sentence, in juxtaposition with a complex concept, causes all elements, individual ingredients, to evolve, to merge or disperse into something other than what was there before. Sometimes this happens with a noted life situation’s influence. A record of something quickly seen, or a theme challenge either starts or enhances the new or long evolving ideas. Then the entire content shifts and what was added alters that balance, again. Each piece starts differently and has different measures of balance and discord. I start with combinations of words from notes I almost always make, and place them on a page, moving back and forth as image grows and turns into color. I hear words when I read them. While I work, the words turn into the image, and the image is the word heard. Each theme develops at its own required speed: pensive, or chaotic, or restful or at a fast pace. Almost always I build pages and bookworks from the ground up. Working back and forth, page here and then there again, word and image as one grow. All this goes on all the pages of one bookwork in the same back and forth rhythm. I must create rhythm and pace, cause loudness or quiet, allow rest or activity, as I remember agitation or pleasure. Balance of weight of words and more words as image, with color and weight of line and mass, happens after contemplation then action, thought and reaction. One thing changes everything. All relationships are decided by trial and error, in the context, and environment. Everything happens in relationship to everything else. Word placement, line length next to line weight, color next to color, word next to image, and dark next to light—these are just a few components that cause weight shift and change. I consider all of these components consciously all the time. Experience, trial and error, and then instinct takes over. But the work itself directs me and tells me what it needs and wants. A merging in the first work completed in the series DRIFTS is a combination of two pages. From the paper bookwork, 6 WATER VOICES, 35 mm slides of pages #4. PUDDLING and #5. PROCRASTINATE, were scanned into the Imac computer and were set one on top and another below. Sections were changed. Words and images were added; a new work evolved. Variations of the original complex virtual collage follow now, with a letter or two, or an object added. Each offshoot, manifestation, is altered slightly, evolved, and is slightly different, with a different title – DRIFTS, DRIFT HERE, and DRIFT AGAIN. All happened while I remembered, seeing/hearing the sound of the country stream/river/creek next to my window, heard again in the city sounds. Daily reminders of water in its various forms and containers inform my thinking. Water towers imply water contained, water towers reflect on the water surface; my environment, reality adds images/layers to the work, that is now in virtual reality. As well, from 6 WATER VOICES, created as facing pages using stencils, ink pens, brush and gouache, plus misc. media, is LISTEN-HEAR. Parts of the pages in the entire bookwork were written and rewritten first as lists/prose over months of word working. The stencils’ outlines were marked first with graphite on acid free paper, and often changed or corrected before the gouache was used. Color was selected while thinking of both water at various depths and times of day and year, and the sound of both shallow and rushing water. The brush size and collage were carefully and intuitively informed selections, depending on size and hue and color value needed. All happened while remembering the stream’s gurgling sound again, in the city’s humming. Water: there in the rivers and rain, and imagined inside the multiple water tanks sitting on the buildings. 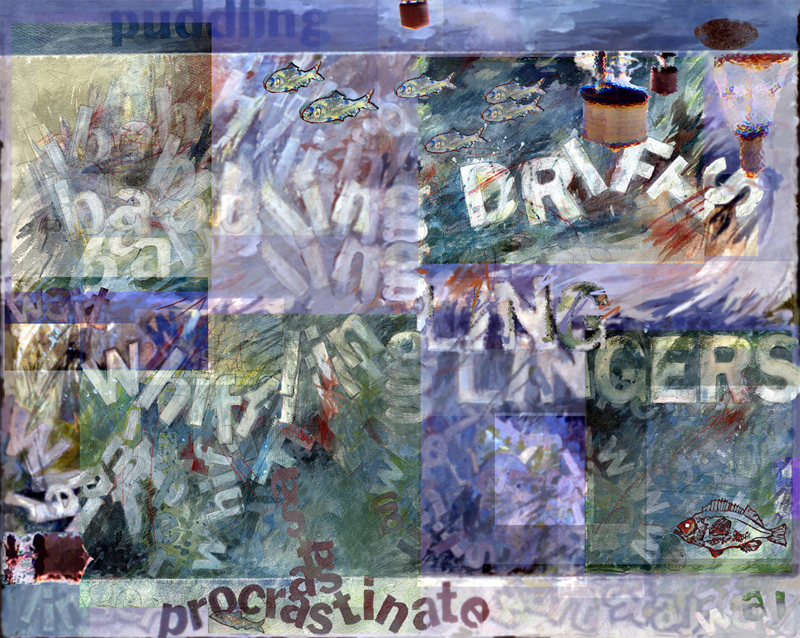 REST, was 37″h x 48″w*, visual poem/drawing, facing page. 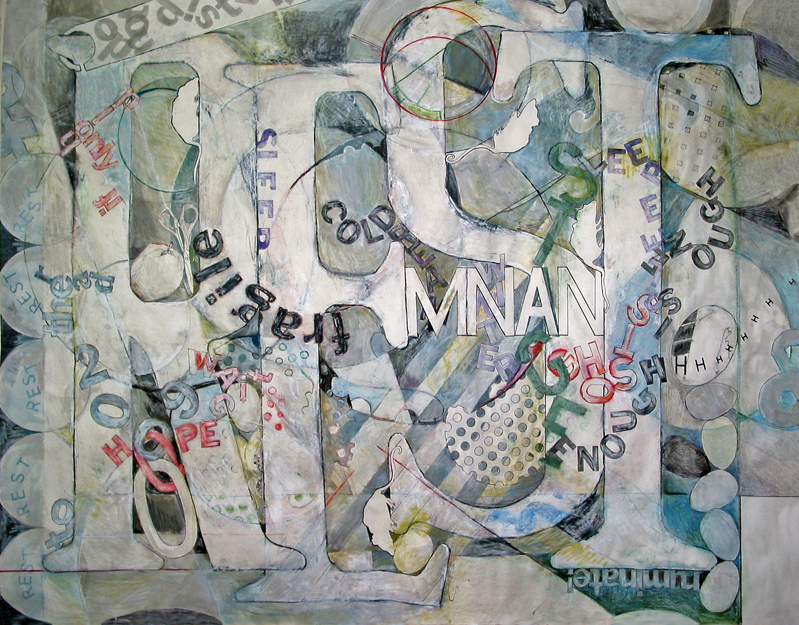 OR WORK, was 37″h x 48″w, visual poem/drawing, facing page. Each title REST and OR WORK took almost a year. The words are the image, and the image is the word. The word REST filled a large piece of paper then was circled and nested with images and words, back and forth, around the page as needed. The words OR WORK were done the same way later, on another sheet. Content was based on my life (always eggs/birth, growth/continuation, and mouse/the uninvited always returning), and while working on other things. Although individual works, these two were created as a pair. Their edges fit together, either one on the right or left, or one above and the other below. Largely from colored pencil over graphite outline with created and purchased stencils, on watercolor washes, the works grew ground up, changing balance in sections, and weight in areas. Except in their photos and in altered images in virtual reality, the experimental works no longer exist in the real world. 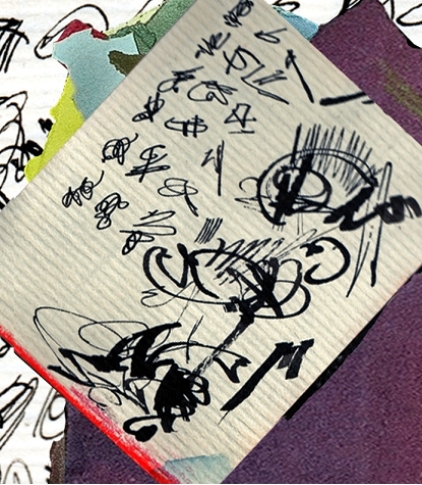 NVW: The term “asemic writing” was new to me, but now I’m seeing it everywhere. Language that is without semantic content. It looks like language, but we cannot glean a precise meaning. Could you speak a little about how you see this sort of language functioning in your own work? MRR: In works without any words at all, the reading sensation still exists. There are a variety of works or part of works that contain what seems to be indecipherable language as calligraphic type marks. I think of them as records of events or talks to the dead and newborn in a language only they will understand. They are in groups living in the context of their page and bookwork. They are language before language; they feel as if they are the same as reading poems in a foreign land in its language. They are thoughts marked in code, my thoughts, my code. The sound is like a hum, a whisper, or jazz scatting. The visual shapes and placement of the marks, in combinations, make the mass and color, the rhythm and pacing. My abstract language is almost never made with repeated sections or combinations since a new read/sound always happens in each cluster. NVW: There often seems an ongoing narrative moving through your books. So do you think of them in some ways as novels or a series of visual poems? MRR: Life’s situations in combinations, and the observation of the dying and death experience, have been highlighted during the turn of the century in my works: birth and life; before birth and after death; the past/memories; dead hopes and satisfied joys of life and living it intensely make up the content. Abstracted narrative is often included. Diaries and lists are often here as visual poetry, often in unbound or bound artists’ books or bookworks. Dense and intense, some of the works have the qualities involved in ritual and meditative objects. The pages are sequential, for sure. Often the bookworks have a beginning and a middle, and then begin again—cyclical, or spiral—like the circle or egg. The two continuous shapes so often are in my works. Read the book first and at the end, turn it over, read again, and a new work emerges, one experiences it all differently. There is the fragmented circle, the broken unity and hesitations in continuity rather than that complete circle. 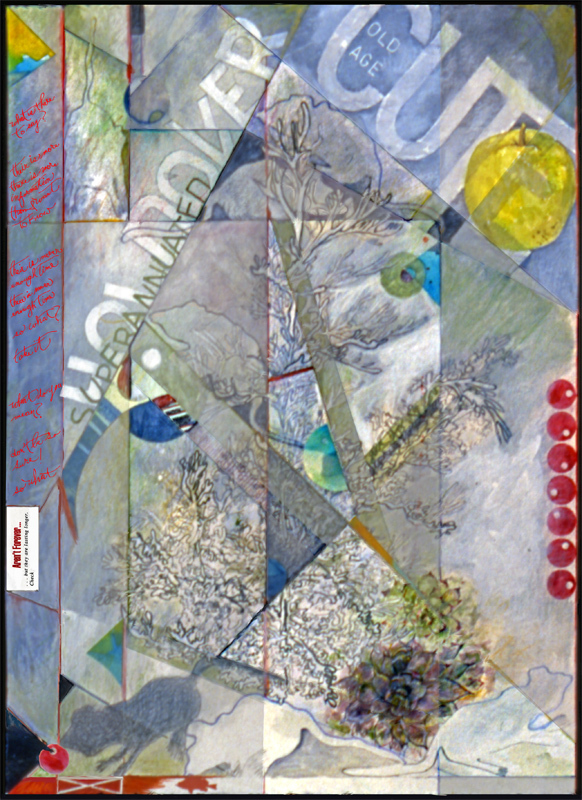 One or more themes runs through a series or one bookwork that often has its later individual visual poems or artists’ stamp sheet commemorative. Each work or series has its own feelings portrayed and impressions in marks on paper, or in the computer image. From the one image of a work, and seeing only one open folio or standing bookwork in exhibition, the visual is there but the verbal and theme are often hidden, waiting to be read/seen, the sequence totally lost. The image frustrates the reader/viewer since the actual is not there to see, to see what went before or after; the same frustration, or greater, is in an exhibition when the item is so close but still unapproachable, untouchable, although a complete section is shown. This method both irritates and/or excites the reader/viewer’s appetite for more. What does this say about me, that I like to tease or agitate the viewer/reader? But that reader/viewer who holds the work in her/his hands is usually greatly satisfied while reading and seeing, and knowing the content and having the book’s secrets. OPEN HOUSE, closed 8 1/2” h x 5 1/2”w, especially pages 10-11 with the scissors collage, photo copy edition visual poetry artists’ book with movable collage. Edition 100, printed with five different photo printers. NVW: How has your work changed the most over the years? And/or, how is what you’re working on now a departure from earlier work? MRR: The only way to know what was and is now is to compare earlier works with later pieces, but I am not as objective about my works as I may often be about the works of others. I think that my work is more available and open for interpretation and not as hidden and mysterious in content as it once was. My long workdays cannot go on for weeks at a time anymore. Workdays replace weeks, and part days for full days, so concentration is broken. The body will not cooperate; time goes, much is not done, less work produced. Different studio spaces change my works’ themes and size. Although using the computer and copy machine for decades, to use as collage materials or to create editions, now I find I almost never use the copy machine. For years, almost always my own publisher, now others invite me to publish my editions and I try to follow each of the size, page number, and shape and paper formats they need. They sometimes slightly edit or make minor suggestions, as in all collaborations I have done before. Before my theme concerned a younger woman’s life experiences and thinking and young family; now the sources are an old woman’s. Maybe the work is less complex, I am not sure. But the angst and playfulness are there still, maybe redirected. Marilyn R. Rosenberg was born in Philadelphia, PA. In 1978 she completed a Bachelor of Professional Studies in Studio Arts at Empire State College, State U of NY and in 1993 a Master of Arts in Liberal Studies from the Graduate School of Arts and Science at New York U. While raising a family she continued creating works on paper. Her studies included painting, graphics, sculpture, a variety of other art, gender, history, literature, and religious studies, life drawing, advertising art, advertising publication, book and printing production (older style), book arts and more. 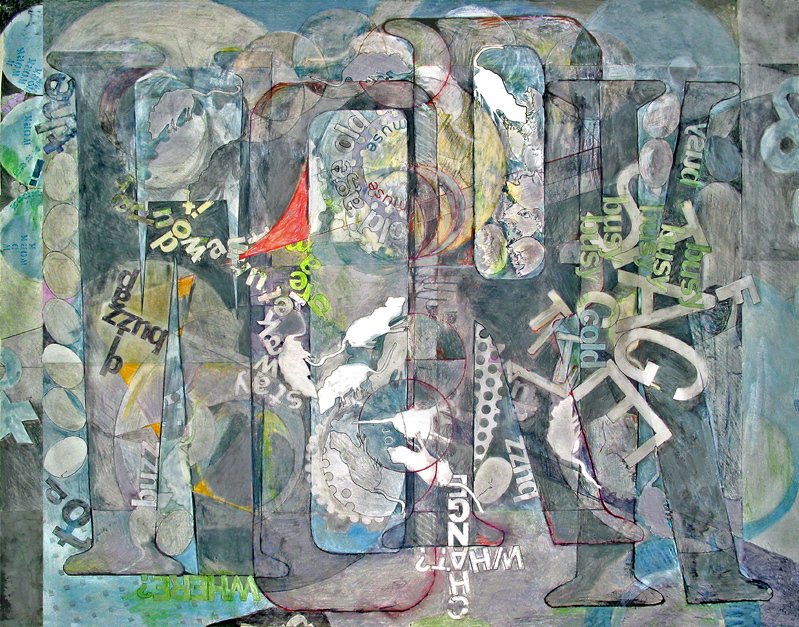 Since 1977 she has amassed a body of work consisting of more than 600 titles that include visual poems, artists’ books, mail art, drawings, small press/chap books, unique sculptural bookworks, artists’ stamps, photos, paste on paper and computer collages, and other works. Her art is included in public collections or archives at Harvard University, Fine Arts Lib., Fogg Art Museum, Bibliotheque Nationale, Paris, Brown University Library, Dartmouth College, The Tate Gallery, and many others. Her works are also in such anthologies as LAST VISPO ANTHOLOGY: Visual Poetry 1998 – 2008, Fantagraphics Books, 2012 and 500 HANDMADE BOOKS: INSPIRING INTERPRETATIONS OF A TIMELESS FORM, New York, Lark Books, 2008. 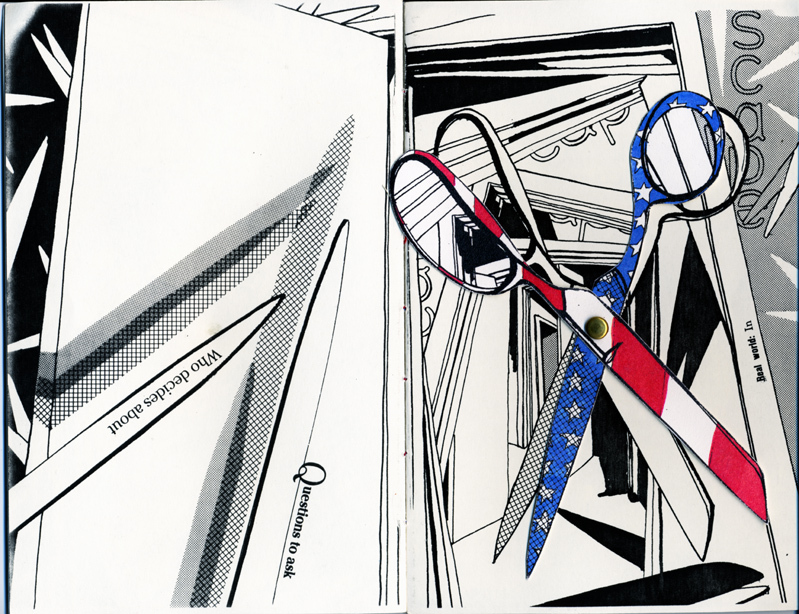 2012, FEMINISM AND THE ARTIST’S BOOK, Vespa Properties, Brooklyn, NY, Curator: Maddy Rosenberg for Central Booking Gallery. 2012, POINT OF VIEW, juried invitational, WCC Gallery, Peekskill, NY. Jury and Curators: Sherry Mayo, Geoff Feder & Larry D’Amico. 2012, VISUAL POERY EXHIBIT, General Store Community Arts Center, Mount Barker, South Australia. 2012, REJOICE, Ceres Artist Friends Exhibition, New York, NY. 2011-2012, WRITE-NOW, The Chicago Rooms Galleries of the Chicago Cultural Center, Chicago Illinois, USA. Curator: Keith A. Buchholz. 2011-2012, Apocryphal, Traditional, et al, Georgia College & State University, Milledgeville GA, USA. Curators: Shannon Morris and John Coffelt. She is also the author of three collections of short fiction and a recent recipient of a Christopher Isherwood Fiction Fellowship. Her stories have been published in AGNI, The Massachusetts Review, The Sun, and Kenyon Review. Boneland, her fourth collection of fiction, is forthcoming in October from U. of Oklahoma Press. She is Professor Emerita in Eastern Washington University’s graduate creative writing program, as well as a faculty member of Vermont College of Fine Arts’ low-residency MFA program. She lives near Spokane, Washington with her husband, the artist Rik Nelson. Click this link to see a collectionof Nance Van Winckel’s mash-ups of poetry and photography, which she calls photoems. Wonderful to see! Thank you for sharing these wonderful collaborations. Gorgeous. Thanks for giving us such a satisfying glimpse of this artist’s work and such a revealing exploration of her process. I thoroughly enjoyed spending time with Marilyn’s collage work. Glad it was of interest to others too. Simonides is also credited with observing that “the logos (articulation of innerness) is a thing’s eikon (image).” It seems to me that one part of poetry’s task will be to emphasize the bare relation of articulation and image. 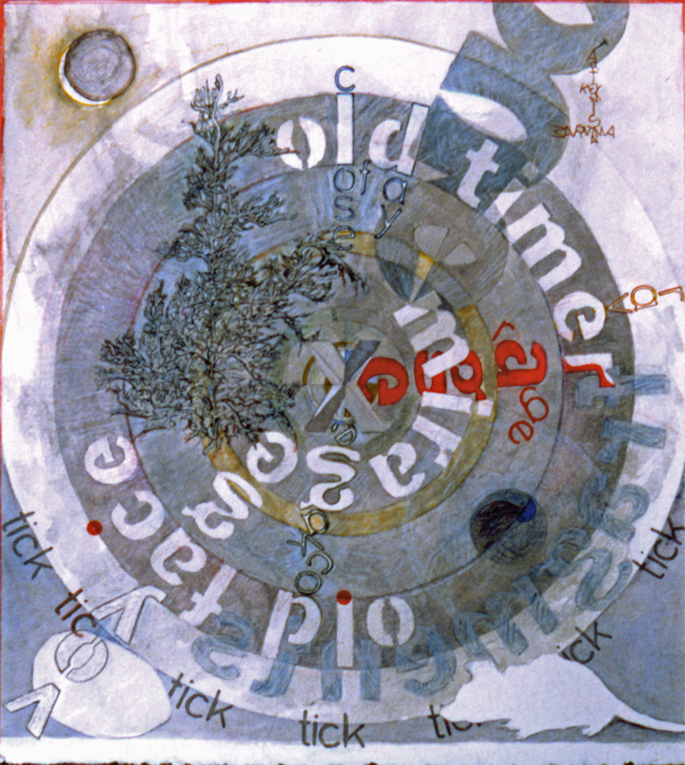 Rosenberg’s work with book arts and text-rich collage//assemblages handles this. To titillate and frustrate the expectations for syntactic conventions, as she notes, heightens the desire to explore a piece further. In this way, I think (at least visual) poems also resemble sculpture, with its inherent play within the cycle of concealment and revelation, though painting, too, is involved with this cycle. One critical strength of the artist’s book/bookwork is that it allows–even urges– the reader/viewer to crack open the work of art and commingle the work’s tactile aspect with its aural and visual dimensions. Rosenberg’s approach to a work’s balance seems to hinge, in large part, on compositional criteria that are visual. This can be very instructive to poets who may not think of their work as visual art, which it is, as long as it is written to be read/viewed. That is to say, the written poem intended to be read has a primarily visual appeal, presented on paper with marks that signify particular phonetic values and semantic regions. The artist says: “I hear words when I read them. While I work, the words turn into the image, and the image is the word heard.” This further, aural criterion challenges poets to compose the poem on a page in such a way that the visual arrangement contributes to the acoustic, both of which will affect the semantic. I agree with and like what you say, David, about a poem’s visuality torquing its aural dimension. “Seeing” the words as graphic elements is a wonderfully interesting, complex, and thoroughly engaging challenge and delight. annamarjohnson and noramaynard, I am so glad you enjoyed the work and the interview. Thank you David for your close reading of the interview and your positive comments. Nance, your questions did get me to the details’ core. Thanks for finding me for interview. So wonderful to see a sensitive and intellectual approach to the combination of words and art!